Rent Penthouse Oasis Soleado a luxury vacation rental condo at the beachfront condominiums, Mareazul, Grand Coral, Playa del Carmen, Mexico. 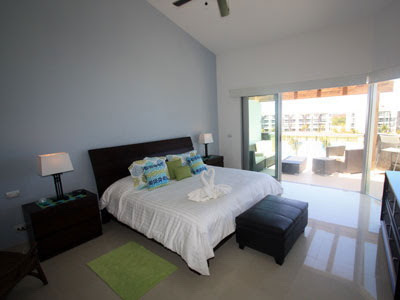 Feel at home in your very own beach side penthouse over looking the warm turquoise waters of the Mayan Riviera. 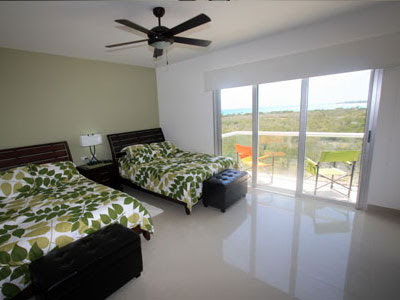 This modern 2 bedroom, 2 bathroom penthouse offers ocean views from the living room, both bedrooms, the large terrace and roof deck with private Jacuzzi. From your front door you can be on the soft white sand within 60 seconds. And within 3 minutes via car you can be at the Nick Price Club House teeing up for a round of golf. 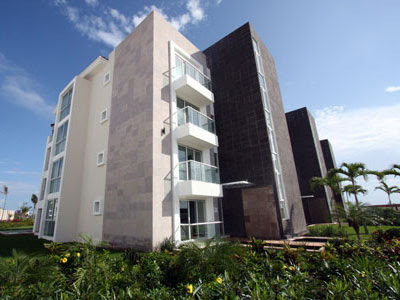 Penthouse Oasis Soleado is located in the Mareazul Condominiums, a brand new luxury condo development only a 10 minute drive from downtown Playa. Enjoy the over 10,000 sq. ft. of seemingly endless pools accented by beautifully landscaped gardens and fountains. Dine beachside at the adjacent beach club with fantastic food and warm infinity pool. The adjacent Grand Coral Golf Club with currently 9 holes open will provide endless hours of entertainment. Your stay at Penthouse Oasis Soleado includes membership to this golf club, as well as preferred tee times and reduced green fees. The spa offers the latest in fitness and weight training equipment along with sauna, steam room, whirlpool, lockers and massage rooms. Only a small percentage of the 300 luxury condominiums will be available in the rental market as the majority of owners are part time residents. Check in/Check out: Check in is after 3:00 p.m and check out is before 10:00 a.m.
House Rules: You are responsible for the property at all times during your visit. It is your responsibility to make sure all doors and windows are secure and locked before leaving the unit, even if it is for just a quick stroll down the street. These few extra steps will ensure the security of your belongings. Exceeding the maximum amount of people allowed by the agreement may result in an eviction at the property managers own discretion. Maintenance: It is the responsibility of North American Standards (NAS) to make sure all appliances and utilities are in good operable condition. However, sometimes mistakes do happen and the need for maintenance is necessary. 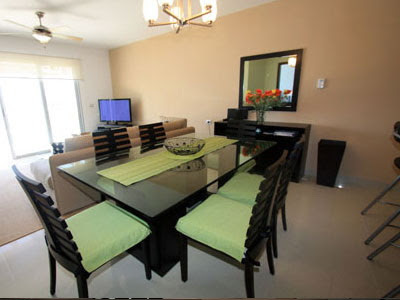 The property manager is available 24 hours a day and will try his/her best to correct the problem as soon as possible. Lockbox, Safe and Keys: Some of our units are equipped with a lock box installed next to the front door. Please do not remove the key from it's chain and put the top part back on after you use it. Changing the lock on the front door or a safe if so equipped costs money. The loss of either the key or the top part of the lock box will result in a $75.00 charge. Maid Service: Maid Service is available during your stay for an additional charge. Contact us for scheduling and pricing. Reservations and Payments: A 5% service charge will be added to the rental rates.